Motor yacht INCOGNITO (Formerly Project Starburst) is equipped with an ultra-modern stabilization system which reduces roll motion effect and results in a smoother more enjoyable cruising experience underway. She is the first Mangusta 165 E equipped with a new power package which provides performance and comfort with higher fuel efficiency. Quadruple – Waterjet Diesel Mediterranean Sport Yacht of contemporary design. Modified Deep V planning Hull, flared bow and transom type stern with integrated swimming platform. 50m Mangusta INCOGNITO. Formerly named Project STARBURST, is the 10th hull in the Mangusta 165 E series. INCOGNITO was sold by Moran Yacht & Ship and our new construction team was there throughout her construction to ensure a smooth build process and delivery to her owner. Besides being a resounding commercial success, the current flagship of the Maxi Open Mangusta fleet is also a style icon destined to last for years and a milestone in nautical history. Official delivery took place at the Overmarine Group wharf in Viareggio. Unit no. 10 is the third yacht in the series to be sold to the American market in the past 3 years. The yacht is characterised both by the new “E” (where E stands for Evolution) aesthetics and four engine propulsion system which the shipyard recently introduced to continue with its programme of constant research and innovation. An excellent performance is combined with greater attention to consumption and onboard wellbeing, both at anchor and underway. Much of this is achieved thanks to the yacht’s new gyroscopic stabilisation system. The latest aesthetics mean more aggressive, more muscular lines, new glazing on the main deck – a single pane of glass where the salon is, which offers excellent visibility from inside and lets in copious amounts of natural light – and a more elongated flybridge with an aesthetic grill astern which gives the yacht even greater dynamic thrust. The propulsion system consists of four 2600HP MTU 16V2000 M94 engines, 4 Rolls Royce/KameWa NP water jets and 4 Seakeeper stabilisers. The result is both that the yacht’s performance is similar to that of the past but with lower consumption and that she is extremely comfortable even when used at low speeds. INCOGNITO’s interior is entirely customised. The Groups’ Design Dept. managed to interpret the Owners’ wishes and requirements beautifully. 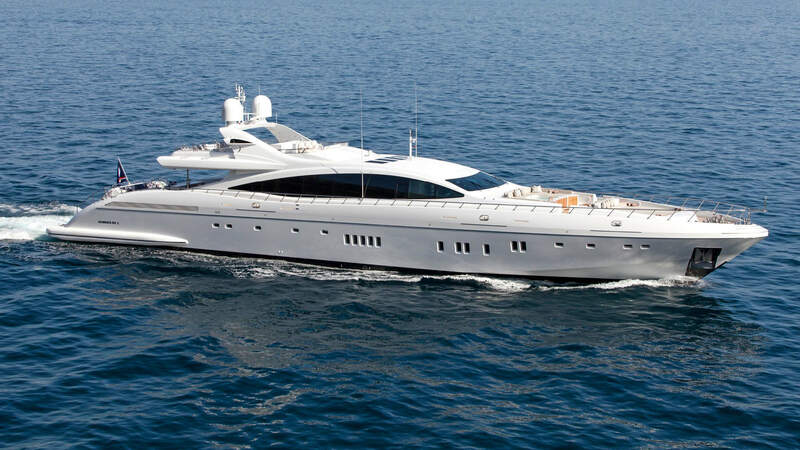 As this is their second Mangusta yacht, they knew exactly what they wanted on board.